What is the best material for a cable sheath or connector housings? Questions like this can only be answered on a case-by-case basis. Unfortunately, there are no simple rules when it comes to choosing the right materials for connectivity solutions, as the specific application always plays a decisive role and requirements can vary greatly from one sector to another. In the food and beverage industry, for example, hygiene is the number-one priority when processing and packaging perishable goods. This calls for materials that can be easily washed down and that do not lose their functionality when they are treated with hot steam. The differences in materials are also reflected in other accessories like connectors or cable glands. To find out where exactly these differences lie in the cables, we need to look at the most important cable components, starting from inside at the conductor and insulator and then working outwards to the sheath. The conductor is often made from bare copper, although tin- or silver-plated conductors can be a more sensible choice depending on the application and environmental influences. Tin plating protects the copper against tarnishing, a type of corrosion, helping to preserve its high conductivity. Silver-plated conductors offer the same advantage and are often used in high-temperature applications. Conductors require electrical insulation. In single-core wires, it acts as touch protection. In multi-core wires, it prevents current flowing from one conductor to another and causing a short circuit. If unsuitable cables are used in industrial applications, not only can these incidents happen more frequently, but the consequences can be severe, such as hours of production downtime in a factory. Insulation must do more than just provide protection, however. In data transfer cables like Lapp's Etherline, the insulation can determine the transmission quality or, more precisely, the signal losses during transmission. This is because the electrical signal interacts with the plastic and gives off energy. This causes the plastic to heat up slightly and the signal weakens until it causes dropouts. The most important factor here is the dielectric constant of the plastic, which should be as low as possible. Polyethylene and polypropylene are plastics that offer a low dielectric constant. This value can be reduced further by using nitrogen to turn the plastic into a foam when it is extruded onto the conductor. Lapp subsidiary CEAM Cavi Speciali produces its high-quality data cables in a complex process. Here, up to three layers are applied simultaneously from three extruders, while the middle layer is foamed. These cables enable high data transfer rates across long distances and are also slightly thinner than conventional cables because the foam layer offers better insulation properties. The behaviour in case of a fire is another important aspect for cables, in order to meet the fire protection classes of strict regulatory provisions such as the European Construction Products Regulation (ECPR). The easiest way to achieve good fire protection is by mixing the plastic with substances containing halogens, often brominated compounds. This fire protection strategy is highly efficient as it requires few additives, thus maintaining the mechanical properties of the material. In the event of a fire, however, halogen creates noxious smoke that mixes with extinguishing water to form corrosive vapours. Halogen-free flame retardant (HFFR plastics) are a non-toxic alternative, but they require a filling level of sometimes over 60 percent, which can significantly affect the mechanical properties of the plastic. One new trend is the use of so-called synergistic systems. These combine two substances that together provide better flame protection than either individual material would alone. One possible combination is halogen-free aluminium trihydrate and silane compounds. When it comes into contact with fire, aluminium trihydrate reacts to form aluminium oxide and water. This endothermic reaction draws energy from the fire. A crust of combusted material also forms and acts as a protective barrier. Another factor to bear in mind is that flame retardants are hydrophilic, meaning they have the unwanted characteristic of attracting water which, in a worst-case scenario, can cause an electric breakdown. This is not a problem for cables that do not come into contact with water. But in some sectors, like the food industry, where hot water is used for cleaning, different materials are needed. Flame retardants coated with silane compounds are more suitable here. These make the plastic water-repellent. The sheath is subject to even tougher demands than the insulation, as it is directly exposed to environmental influences. It must withstand abrasion, chemicals, cleaning agents, UV light, temperature and much more. Unfortunately, there is no one material that meets all requirements. The material must be tailored precisely to the respective purpose. The mechanical engineering sector uses tried-and-tested cables with sheaths made from polyvinyl chloride or polyurethane (PUR). It offers some of the strongest chemical bonds available. It is difficult to process, however, when producing both the cable and assemblies, as the sheath does not cut easily. PUR is also flammable and expensive. The cable types Ölflex 408P and 409P however combine an outer sheath with the toughness of PUR with an interstice filler functional layer made from easy to process PVC. Cables used outdoors are exposed to the sun and require a different combination of materials: The sheath must contain UV stabilisers. In solar cables such as Ölflex Solar, soot is added to the mix to block sunlight, hence these cables are usually black. The ideal solution for outdoor cables is radiation crosslinking. Here, the cable is bombarded with electron beams. The plastic molecules absorb the energy from the electrons and become interlaced, making the material much more resistant. This allows the cables to withstand extreme temperature swings from minus 40 to 120 degrees Celsius, as well as high mechanical loads. Several materials are suitable for crosslinking, including polyethylene (PE), polyolefin elastomers (POE), ethylene vinyl acetate (EVA) or ethylene ethyl acrylate (EEA). Additives are generally also added in crosslinking, usually around one percent, in order to improve the bonds between the molecule chains. They also reduce the amount of energy required in the process. Unlike unlinked material, which eventually softens, crosslinked material has no melting point. When heated, it oxidises and becomes brittle, which makes it necessary to add antioxidants and stabilisers. Crosslinking offers no advantage at very low temperatures, as the material will inevitably become brittle at some point. This makes it all the more important to select a base polymer that is suitable for low temperatures. Possible materials include POE, linear low-density polyethylene (LLDPE), certain kinds of EVA or thermoplastic elastomers (TPE). If the application calls for tougher mechanical properties, suitable materials include high-density polyethylene (HDPE) or polypropylene (for greater strength), and polyolefin elastomers (for greater elasticity). In the foodstuffs industry, the top priority is resistance against biological influences like microbes and fungi. In cheese factories, the bacteria that help the cheese ripen can corrode a conventional cable in a matter of months, leading to short circuits. Sheath materials made from special TPE, such as those used on Lapp’s robust cables, repel bacteria and are easy to clean. The secret of Lapp’s special TPE is the smooth surface. This is achieved with a smart mixture of additives that fill microscopic gaps in the material and that stay bonded in the plastic matrix even after heavy cleaning with a steam jet. 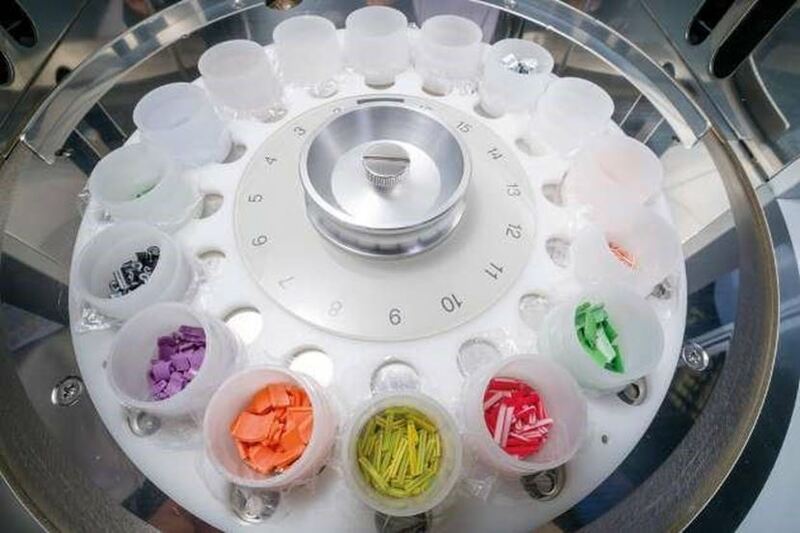 The combination of strong substances with flexible polymer chains in between gives the mixture rubber-like properties, while being as easy to process as thermoplastics. Some suppliers offer PUR cables for use in the foodstuffs industry that offer extremely high mechanical strength. But PUR is hydrophilic. Special TPE, by contrast, is hydrophobic. All of these mixtures, however, are powerless against larger lifeforms like rodents. That is why underground cables are protected with flavourings like vanillin or are specially reinforced. Alongside steel reinforcement, other materials are available that splinter when bitten and spoil the hungry animals’ appetite. When it comes to the devastation that martens can cause, certain materials that do not take on odours may provide a solution. Martens attack cables because they battle over territory and mark it with their droppings, urine and sweat from glands in their paws. Their rivals try to destroy these markings. Cables that cannot be marked are therefore not attacked. Stainless steel is the material of choice when connector housings or cable and hose glands need to withstand chemicals or cleaning agents. In the foodstuffs industry, stainless steel is often essential. It does not rust and there is no coating that could eventually flake off. However, there are different types of stainless steel. Conventional V2A stainless steel is relatively low-cost but often not sufficiently robust when it comes to chemical resistance. Stains can appear on the metal when it is immersed in substances containing chlorides. The foodstuffs industry often uses hypochlorous acid that disintegrates into hydrochloric acid and kills organic substances. V2A stainless steel is not suitable here. V4A stainless steel offers a tougher alloy and is also used on expensive Swiss watches. It withstands impacts and cleaning with coarse brushes. As ever in life, however, for every advantage there is a disadvantage. Stainless steel is harder than brass or standard steel and is therefore more difficult to process. This is especially true of V4A due to the alloy elements chromium, nickel and molybdenum. If its surface is left untreated, V4A is rougher, leading to higher abrasion. Screws that have to withstand high forces across their thread would therefore be stuck. This is why Lapp gives its products made from V4A stainless steel (such as the EHEDG-certified Skintop Hygienic cable gland) a special surface treatment that reduces abrasion and makes it easy to tighten and release the cable gland. Stainless steel cannot be used everywhere. For example.it is unsuitable in rectangular connectors because the metal is too hard to be processed. The connector would have to be milled from a complete block, which would be far too expensive for customers. The housing of Lapp's rectangular connector Epic Ultra is therefore made from nickel-plated cast zinc. This material resists corrosion, such as from salt spray on oil platforms or in the foodstuffs industry. For bolts and brackets, however, Lapp recommends using stainless steel because any coating would be quickly worn off by the frequent opening and closing when separating the modules, such as during cleaning. Cast-on bolts are not suitable here, as the clamping forces and therefore the tightness reduces over time due to the low stability of the material, whether plastic or cast aluminium. But bolts and brackets pose a dilemma for the foodstuffs industry: They contradict the principles of hygienic design, as the nooks and corners can trap splashes from food processing. direct contact with food. Plastic housings used by some companies offer some resistance against acids and alkaline solutions. But they present the risk of low dimensional stability under mechanical or environmental influences. This can also lead to leaks, presenting a safety risk. There is a risk of accidents and high follow-up costs for maintenance and service. Plastic is also unsuitable for applications in which electromagnetic compatibility is important. At the very least, they must be coated with metal to protect against interference. In practice, the results in terms of screening are often disappointing. Wherever metal meets metal, such as a connector and a control cabinet, there is usually a seal sitting in between. It must have similar temperature and media resistance characteristics to the materials that make up the other components in the connector or gland, otherwise it will become the weak link in the chain. Fluorocarbon elastomers (FKM) are the best solution here but are expensive. These resist the effects of weather, ageing, ozone and chemicals, and withstand temperatures of up to 200 degrees Celsius. In moderate ambient conditions, ethylene propylene diene monome rubber (EPDM) is a good alternative. FKM does have one small disadvantage. It is not suitable for very cold environments and should not be used at temperatures under -20 degrees Celsius. Silicon is a better choice for refrigerated warehouses or other very cold or hot environments. On the other hand, it is not suitable for use at very high temperatures such as in furnaces. Just as important as the seal’s material is its design. Seals used in food processing should not have any gaps or crevices where residues could settle. The seals of the Skintop Hygienic range, for example, adjust to the shape of the sealed surfaces and join flush without creating any gaps. For users, finding the right products is not always easy. There is no one right answer here; the best way to proceed is to weigh up the various advantages and disadvantages. Users should always consult experts like the ones at Lapp before potentially making the wrong choice.